The smell of fall is in the air – crisp mornings, warm afternoons, and cool evenings. Just when you thought adventure season was ending, fall enters as the most magnificent time of year to spend outdoors. 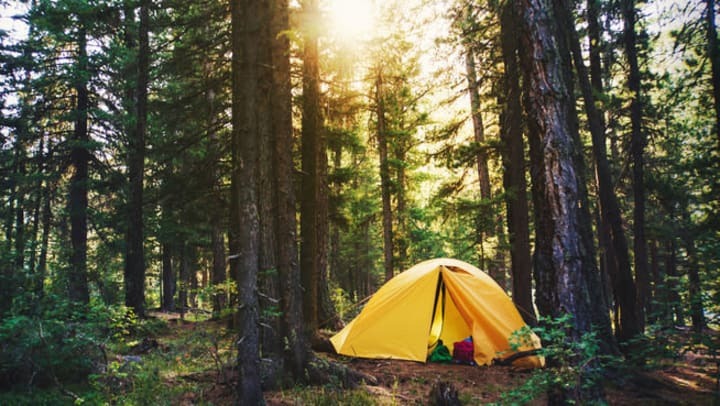 It’s the perfect time to go camping – your favorite spots aren’t as crowded, the colors and sights are beyond awesome, and the weather is perfect for playing during the day or hanging next to a warm fire at night. So, what do you bring and where should you go? Put on your adventure pants, and let’s dig in to the ins and outs of fall camping. Hit the road with your RV or trailer and set out to find the ultimate camping spot with hookups. Make your space as comfortable as you’d like while enjoying the sounds of trees swaying and birds singing. Grab your trusty RV out of your StorQuest Self Storage RV Storage space and get her ready for the road. Don’t have an RV or trailer of your own? There are many rental sites that can hook you up with one for the weekend, such as Outdoorsy. The best part of RV camping is not the final destination but the journey that takes you there. So sit back, and enjoy the ride. Ahem, and relish in that trusty bed you have to sleep on! There’s nothing quite like venturing out and finding the perfect camp spot. Whether you’re looking to pitch a tent at a designated campground or out in the middle of the wilderness, you’ll find waking up to the sounds of nature and a slow-rising sun has never been more invigorating. Of course, make sure you have the essentials: a tent, sleeping bag, plenty of food and water, and a trusty match or lighter to get an evening fire going. Bonfires, sandy toes, and the sound of crashing ocean waves lulling you to sleep – does beach camping get any better? We think not! If you’re able to and it’s nearby, make beach camping a top priority this fall. The crowds are likely to be light, leaving you endless activities and room to roam while enjoying your stay. Bring the surfboard, catch a few waves, and head back to camp where burgers and brats are waiting on the grill. Want to go camping, but don’t have any gear? This fall is the perfect excuse to get out there and explore all of the glamping options available. Perfect for those looking to pack an overnight bag and hit the road, you’ll find many yurts and cabins are fully equipped with everything you need for an evening in the woods. Just bring yourself, a sense of adventure, and a desire to relax and enjoy every moment. Camping at any time of the year can bring happiness and peace. Make sure you are fully prepared to camp safely, keeping nature at the forefront of your mind. Fire Safety - It is very important to follow fire safety rules when starting your own fire. Make sure to only start fires in the designated area and that it is fully out before your drift off to sleep. First-Aid Kit - Have a first aid kit with you at all times. Bugs loved wooded areas, so you’ll also want to pack on the bug spray to avoid being bit. Protect Family and Pets - When you go camping, know that you are invading the home of wildlife. Clean up after yourself to avoid unwanted guests at your site. You don’t have to wait until next summer to go camping. Venture out on the trip of your dreams this fall. At StorQuest Self Storage, we’re here to support you on your journey to make room for awesome. Stay up to date with our blog for even more helpful hints and tips for epic fall adventures.